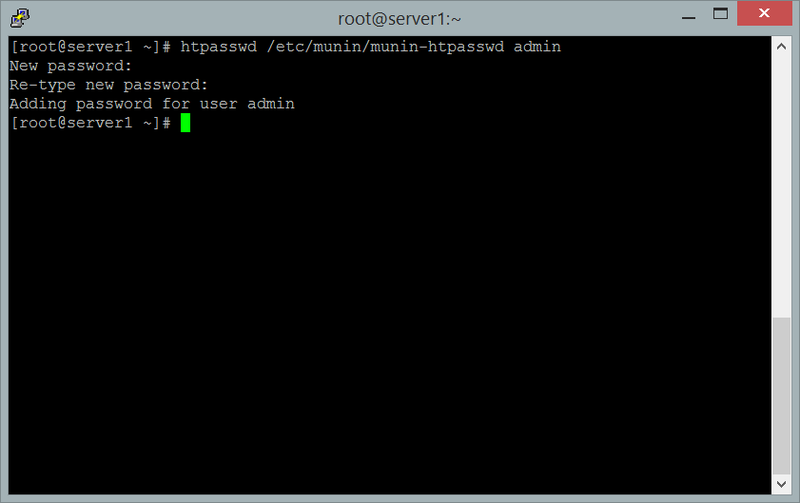 In this article, I will describe how you can monitor your CentOS 7 server with Munin and Monit. Munin produces nifty little graphics about nearly every aspect of your server (load average, memory usage, CPU usage, MySQL throughput, eth0 traffic, etc.) without much configuration, whereas Monit checks the availability of services like Apache, MySQL, Postfix and takes the appropriate action such as a restart if it finds a service is not behaving as expected. 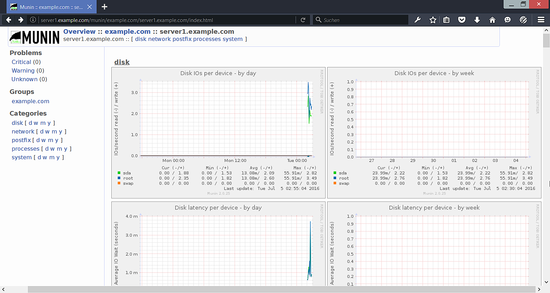 The combination of the two gives you full monitoring: graphics that lets you recognize current or upcoming problems (like "We need a bigger server soon, our load average is increasing rapidly. "), and a watchdog that ensures the availability of the monitored services. Our system's hostname is server1.example.com, and we have a website www.example.com on it with the document root /var/www/html. The command will add a new user with the name "admin" and prompt twice for the new password. "openssl req -new -x509 -days 365 -nodes -config ./monit.cnf -out /var/certs/monit.pem -keyout /var/certs/monit.pemopenssl"
"openssl req -new -x509 -days 365 -nodes -config ./monit.cnf -out /var/certs/monit.pem -keyout /var/certs/monit.pem"
It is a shame that this article does not explain how to get Apache statistics in Munin. That is a wonderful HowTo which worked out fine. However, in my case, the graphics are just empty and stay empty for months. I did a web search but most help pages are not for CentOS.